It's the Friday before the Super Bowl, and you know what that means, right? 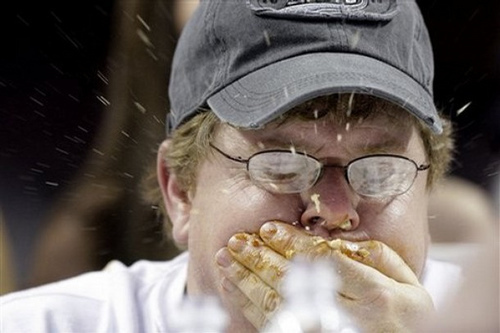 Yep -- it's the annual Super Bowl for competitive chicken wing eaters! Held at Philadelphia's Wells Fargo Center, the Wing Bowl is one of competitive eating's showcase events, with thousands of spectators in attendance, including "the Wingettes, the name given to the bikini- and lingerie-wearing young women who make up each eater's contingent of supporters." More than 125 Wingettes, a record for the event, competed to be declared "Wingette of the Year." Nicole, a pretty brunette, won the title and a 2012 Harley Davidson Sportster motorcycle. Also attending the event as featured Wingettes were adult film actresses Jenna Jameson and Mary Carey. Clearly, the Wing Bowl is totally legit! I was actually rooting for Bill "El Wingador" Simmons after watching Errol Morris' insanely great mini-documentary on the wing-eater on NYTimes.com. (Check it out here.) Sadly, El Wingador placed a distant third, having eaten just 251 wings. (It was, however, a PR for him.) I guess practicing swallowing a baseball-sized sphere of a hundred-plus Tootsie Rolls didn't pay off for Simmons.